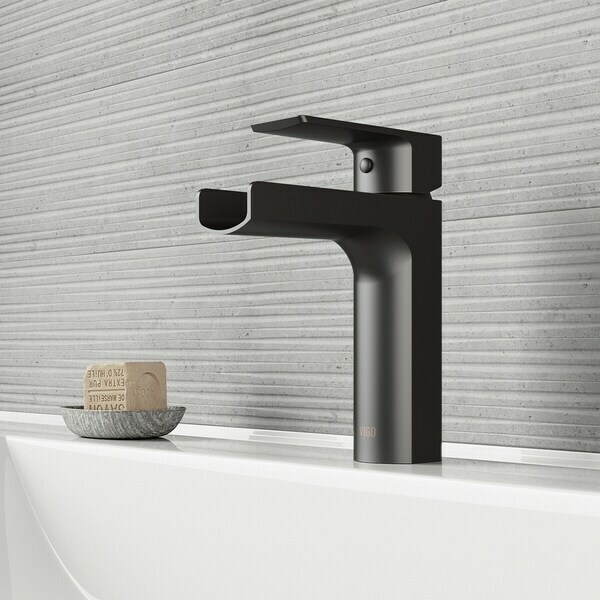 Clean lines and a unique design come together in the VIGO Ileana Single Hole Bathroom Faucet, creating a faucet that's stylish and contemporary. The single handle faucet works with any basin sink, creating a soothing waterfall effect with its trough-style cascading spout. With its solid brass construction and leak-resistant Sedal ceramic cartridge, this faucet will delight for years to come. Dimensions 4.75 In. X 1.88 In. X 6.75 In. This faucet is so well made, being a heavy, all metal construction. It is very sturdy and stylish. I adore the matte black look of it as well! Really nice! Looks like a quality piece, although we haven't got to use it yet. I like that it's different looking and a matte black. I have no doubt we will be getting compliments on this thing. Gorgeous! High quality and good heavy feel. I was worried I wouldn't like the feel of the turn knob but it's smooth and feels sturdy. Very happy with this purchase. Understanding Bathroom Faucet Valves from Overstock.com. Our guides provide customers with information about bathroom faucet valves. How to Install a Clawfoot Tub Faucet from Overstock.com. Our guides provide customers with information about how to install a clawfoot tub faucet. Tips on Maintaining Your Bronze Bathroom Fixtures from Overstock.com. Our guides provide customers with tips on maintaining your bronze bathroom fixtures.